The White House national-security adviser and the U.S. ambassador to the UN stick to a heart-string tugging script on Syria. Either U.S. Ambassador to the UN Samantha Power and National Security Adviser Susan Rice have been working from a script or the two foreign-policy pros, both mothers, share a remarkable affinity for making similar points in the same way. There's a clear similarity between their vivid descriptions of gassed Syrian children during recent speeches making the administration's case for congressional authorization to use force against the regime of Bashar al-Assad. Gassing children is especially heinous. "They unleased hellish chaos and terror on a massive scale. Innocent civilians were jolted awake, choking on poison. Some never woke up at all. In the end, more than 1,400 were dead, more than 400 of them children," Rice said. "Standing up to the Syrian regime's barbaric use of chemical weapons will affirm the most basic of principles, that nations cannot unleash the world's most horrific weapons against innocent civilians, especially children." Noted Power: "These weapons kill in the most gruesome possible way. They kill indiscriminately. They are incapable of distinguishing between a child and a rebel. And they have the potential to kill massively." The parental agony is unimaginable. "In recent days we've been shocked by the videos from Ghouta and other neighborhoods near Damascus. As a parent, I cannot look at those pictures, those little children laying on the ground, their eyes glassy, their bodies twitching, and not think of my own two kids. 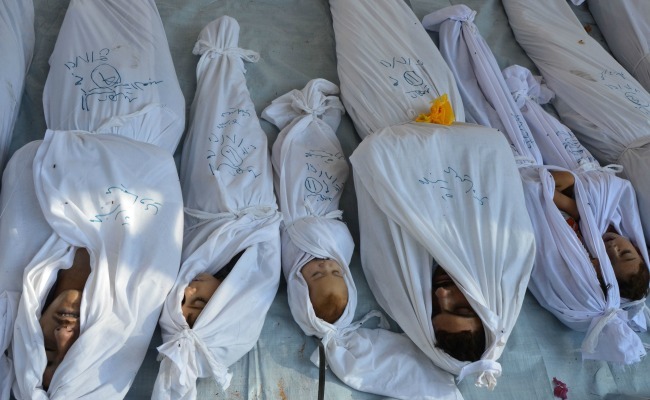 I can only imagine the agony of those parents in Damascus," said Rice. Agony was also on Power's mind: "What comes to mind for me is one father in al-Guta saying goodbye to his two young daughters. His girls had not yet been shrouded. They were still dressed in the pink shorts and leggings of little girls. The father lifted their lifeless bodies, cradled them and cried out: Wake up! What would I do without you? How do I stand this pain?" she said. "As a parent, I cannot begin to answer his questions. I cannot begin to imagine what it would be like to feel such searing agony." Children were killed in their beds. "If we begin to erode the moral outrage of gassing children in their bed, we open ourselves up to even more fearsome consequences," said Rice. Said Power: "We share the deep conviction that chemical weapons are barbaric, that we should never again see children killed in their beds, lost to a world that they never had the chance to try to change." I've been to more than my share of war zones. Each is horrible and uniquely tragic. But this most recent atrocity is particularly gut-wrenching. And unlike those tragedies of earlier decades, we have the technology on our computers and our smartphones to see the full force unfold in real time. Children lined up in shrouds, their voices forever silenced; devastated mothers and fathers kissing their children goodbye, some pulling the white sheet up tight around their beautiful faces as if tucking them in for the last time. There are no words of condemnation strong enough to capture such infinite cruelty, but where words may fail us action must not. Every adult American, every member of Congress should watch those videos for themselves, see that suffering, look at the eyes of those men and women, those babies, and dare to turn away and forsake them. In short: Do it for the dead children of Syria.